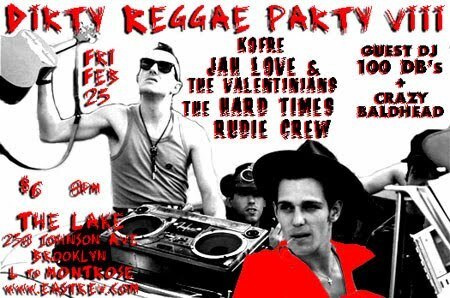 Here is a heads-up to anyone looking to experience the burgeoning Brooklyn ska and reggae scene: Dirty Reggae Party VIII is this Friday February 25th at The Lake in Brooklyn, New York. I'm particularly excited to see the Rudie Crew featuring lead vocalist Roy Radics (who often toasts with my band Bigger Thomas) because they will be previewing songs from their upcoming Megalith Records release 'Skragga'. The band have been mainstays of the New York Ska scene for many years with members who played in The Boilers, The Beat Brigade and later Skinnerbox and Stubborn All-Stars and their new record should help spread their inspired sounds to a much wider audience beyond New York City where they tend to play most of their shows. True to its title, 'Skragga' is a great mix of 2-Tone and 70's and 80's British-style reggae (particularly early UB40, Aswad and Steel Pulse which Radics and saxophonist El Hussey listened to growing up in North London). Add Radics' patented ragga-style chatting and toasting on top and you have a classic in the making. The band shared a few promotional tracks from the album with me which can be streamed below. The first track 'Propaganda' is already a live favorite featuring a great hook courtesy of the band's horn section of Hussey, trumpeter Dan Dulin and trombonist Chris Malone. I'm also a big fan of 'S.U.V.' which takes the owners of the gas guzzling vehicles to task for all the pollution they spew around New York City. Can't wait! It's going to be an incredible night of music! rudie crew!! watch me now! Waaa!